To understand Kimoto and how it effects the style or taste of Sake, we have to first look at the technique and history of making Nihonshu [Sake]. The words ‘Shubo’ or ‘Moto’ in Sake-making means the yeast starter or starter culture. This is where a small amount of the raw ingredients are combined to create this starter. Creation of the Shubo is to cultivate active yeast cells in a pure form in mass quantity. In modern Sake brewing this can be done one of three ways. The most common way of creating the starter is called Sokujo or the ‘modern’ method. The other two ways are both ‘traditional’ methods known as Kimoto and Yamahai. The Kimoto yeast starter method was developed early in the Edo period (1603-1868) and the other variation on this traditional approach to creating the starter, Yamahai, was born in the Meiji period (1868-1912). Both of these methods rely on cultivating lactic bacteria (which exists in the air, everywhere) to be included in the starter preparation. These lactic bacteria feed the yeast in the starter and produce lactic acid which prevents contamination from unwanted microorganisms. With the Sokujo method, lactic acid is purchased by the brewery and simply added in with the other raw ingredients. Essentially ‘feeding’ the yeast instantly and creating an acidic environment preventing spoilage from any unwanted microorganisms. The Kimoto starter culture involves more microorganisms than the Sokujo version, therefore requires more technique and handling. 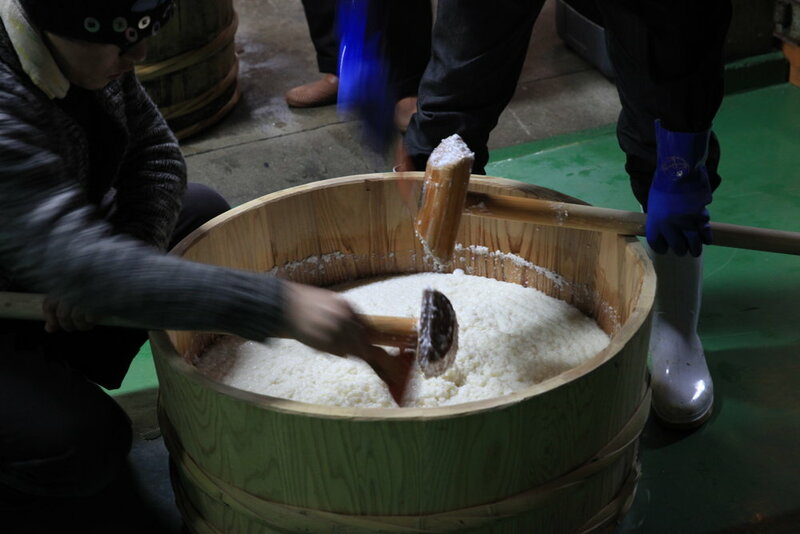 It also creates highly alcohol resistant yeast which gives active fermentation even towards the end of the Sake brewing process, producing Sake with a rich and powerful taste. Kimoto-starter making begins by mixing steamed rice and Koji (steamed rice that has been inoculated with the starch breaking mould Aspergillus Oryzae or Koji-kin) with a spatula inside a shallow tub called a Hangiri. Water is also added and mixed creating around 6 - 8 tubs with a total of 100kg of mix. These tubs then are mixed by using long bamboo poles in a process called Yama-oroshi. Where 2-3 brewery workers mix constantly for several minutes before stopping and repeating the process a few hours later approximately 3 - 4 times during the first day. The tubs are then progressively mixed together combining them over several days until the complete mixture is brought together. After another week the conditions are perfect for yeast to grow and in modern Kimoto-starter making a choice is made whether to add cultured yeast. If no yeast is added, strongly acidic yeast exisiting in the brewery (Kuratsuki kobo) will begin to propagate in the starter. Before completion the Shubo will go through a 1 - 2 week conditioning period to further enhance the fermentative strength of the yeast. Then once ready the Shubo will be used to create the main fermentation mix and the Sake making process continues onto the next stages. Sake made in the Kimoto method generally tend to be richer in taste and higher in acidity than those made using the modern Sokujo method. You as the drinker will find Sake that has a more savoury nose and palate along with a strong influence of acidity in along a similar vein with the acidity you find in yoghurt or cheese. These Sake are excellent young but also lend themselves to ageing in the short, medium or long-term. A truly unique and expressive variation of Nihonshu. Posted on October 27, 2018 by Matt Young and filed under Kimoto and tagged Kimoto Junmai. Sake Matsuri is back on again in Sydney on October 20th. We are excited to be involved in Australia's first and largest Sake festival. Come and try over 60 different varieties of Sake brought in from Japan by Australia’s best importers. Taste and embrace both new and traditional styles of Sake, from fine Junmai Daiginjo and Namazake to umami rich Junmai, and flavoursome aged Koshu Nihonshu. All alongside awesome food and palate-cleansing Japanese beers. Your ticket includes ALL Sake tastings plus a stemless Plumm wine glass to taste from and keep. This is the first time SAKE MATSURI, Australia’s largest Japanese sake festival, will be held in Melbourne. Tickets are limited, so don't delay! Posted on May 30, 2018 by Matt Young. Hiroshima prefecture lies in the middle of Chūgoku region on Japan’s main island Honshū. Most of the prefecture consists of mountains leading towards Shimane Prefecture, and rivers that produce rich plains near the coast. Many small islands are also included in this prefecture. Hiroshima is well recognised as one of Japan’s top sake brewing regions and small craft breweries, many with very long histories, are scattered throughout the prefecture. Of particular note is the small town of Saijō, east of Hiroshima city, which is famous for its many Kura [Sake Breweries] including Kirei Shuzō. Saijō is considered one of Japan’s three major sake brewing areas alongside Fushimi in Kyōto and Nada in Hyōgo and its brewing tradition dates back to around 1650. In the last 100 years in particular, the breweries in Saijō have really begun to flourish with premium brewing techniques being developed locally. Posted on April 21, 2018 by Matt Young. We are excited to announce a Sake Dinner at Provenance Restaurant in Beechworth on Friday 2nd December 2016. The delicious 8 course menu will be matched with some wonderful Sake from the Black Market Sake portfolio. Provenance Restaurant in Beechworth has been at the forefront of the movement to introduce Sake to the modern Australian menu. The range of flavours and textures that Sake offers brings a whole new palate to the art of food and drink matching, and Sake is now an important, even crucial part of what Provenance Restaurant offers. Michael Ryan, chef and owner of Provenance, will create an 8 course menu to highlight the ability with which Sake can work with food. Dinner starts at 7pm. The cost for the dinner is $220 (8 courses with matched Sake). Posted on November 7, 2016 by Matt Young. World Sake Day - Sale! To celebrate World Sake Day on October 1st, we are offering 15% off all Sake across blackmarketsake.com. This offer runs from now until midnight on October 1st. Our usual offer of free shipping on all orders over $300 still applies - just use the coupon FREESHIPPING2016 on checkout. Don't delay and secure some amazing artisanal Sake to celebrate World Sake Day! Posted on September 25, 2016 by Matt Young. One of our most exciting recent discoveries, the 'Kikutaka' Sakes have arrived. Fujiichi Shuzō was founded in 1870 and is located north-west of Nagoya in Inazawa City. The Toji [Master Brewer] here is Katsuaki Yamamoto, who took over the head brewer role in 2012. In the short time he has been Toji, Yamamoto-san has quickly placed Fujiichi Shuzo on the Sake ‘map’ with the creation of the ‘Kikutaka’ brand. 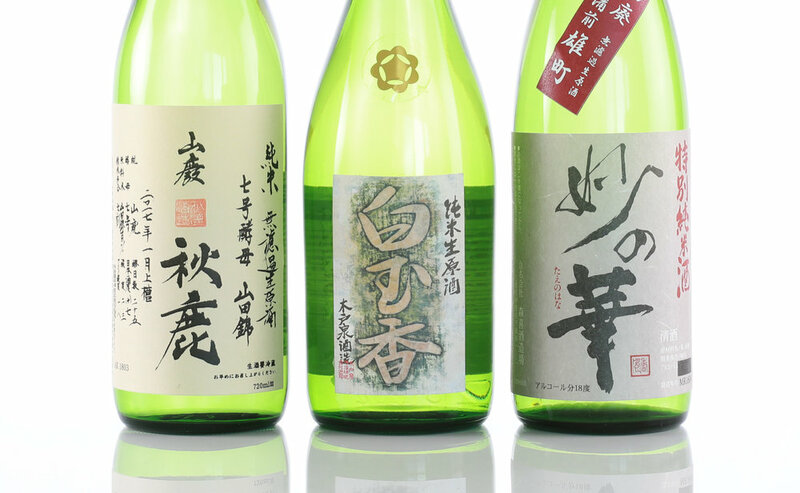 With this range of products under the Kikutaka label he concentrates on creating Sake with a lot of umami and acidity. This is achieved by meticulous work in the Koji room, where he strives to have every individual grain of rice fully coated before being used in Sake production. This level of care and work ethic has ensured the ‘Kikutaka’ brand as being one of the most sort after in the growing domestic landscape of Sake appreciation. We are excited to offer these amazing Sake in Australia for the first time and also the first country outside of Japan to receive these products as Fujiichi Shuzo have never exported before now. Posted on July 31, 2016 by Matt Young. We're excited to be part of Mental Notes - a wine party hosted by DRNKS and Mary’s. A tasting of epic proportions at the National Art School, in Darlinghurst on Saturday the 30th of April. You’ll have the opportunity to try over 100 wines from Australia and all over the world, as well as meet the people who make them and import them. In addition, you’ll also be able to sample some rare sake and even rarer spirits. There’s food on the day, provided by Mary’s and the team from Icebergs, and The Unicorn will be running a bar for the duration of the event, so you can slide past for a beer or a glass of wine before, or after the tasting. Posted on April 21, 2016 by Matt Young. Our brand new site is now up and running. Here you'll find information on all of our producers and their products, as well as having the ability to purchase these products directly from us. We have also added some basic information on Sake and a glossary of terms to help you navigate the complex world of Sake. But don't stress too much, if you have any specific questions please send us an email to hello@blackmarketsake.com and we'll do our best to answer any questions you might have. Please be sure to sign up for the latest news & offers from us here at Black Market Sake.